Apple's patent theft accusations against HTC got a lot of press this week, as they should! But it's just the most recent case in a gun-slinging mobile landscape riddled with patent lawsuits. This'll end about as well as Reservoir Dogs. The NY Times breaks it down today with this handy chart of who's suing whom. 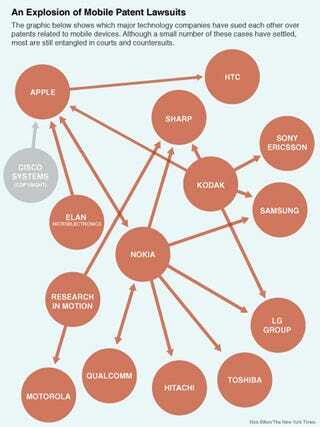 Nokia has been particularly active, along with Kodak. The biggest target? Apple. Although patent litigation is not new in the technology world, these suits, specifically around mobile, point to the drastically changing mobile landscape. Lawyers I spoke with explained that mobile technology is still in its infancy and these large computing companies are trying to stake their claim to the future of computing. Basically, it's a land grab. Companies that know they're being left in the dust (Nokia, Kodak) are scrambling to assert any claims that they can, while market leaders (Apple) become fat targets. How Will Apple and HTC&apos;s Little Spat Affect the Cellphone Market?